InVogueJewelry: Is Any "Hydroquartz" Genuine Synthetic Quartz? What is a Nanogem? Is Any "Hydroquartz" Genuine Synthetic Quartz? What is a Nanogem? Quartz is grown in laboratories for industrial purposes and to make synthetic amethyst. Some of the material becomes synthetic citrine quartz. The key word here is "synthetic." Synthetic gemstones are lab-created gems that have the same chemical and physical properties as natural gems, plus of course the same optical properties. In other words, they look the same but also are chemically identical. There is a difference between "synthetic" and "hydroquartz" stones. Although I've written many times about all of the so-called "Hydroquartz" in many different colors, such as London Blue Quartz, Swiss Blue Quartz, Ruby Quartz, Emerald Quartz, Tanzanite Quartz, and so forth, I will mention again: these are not genuine Quartz at all, but are glass. This material is sold in blocks and used to be called "Hydroquartz Glass" but the word "glass" has gone missing in recent years. Also quartz and glass are similar looking ("optical" quality), quartz is a mineral with crystal structures and glass has none (so different physical and chemical properties). Lab-created gemstones are an expensive process. It's cost-effective to create precious gemstones such as corundum (rubies and sapphires) and other gems. Amethyst, a semi-precious gem, is the most popular and expensive of the quartz gems. Amethyst, which is purple quartz, is grown in labs because it is the most valuable type of quartz. In fact, as I've mentioned, it's getting a little more difficult to find natural Amethyst because there is SO much of the synthetic variety---which can range from light pinkish purple to deep purple. There is no difference, chemically or physically, between synthetic and natural Amethyst. Citrine is heated Amethyst. It can be golden, yellow, or a deeper "fire citrine" orange color. It can occur naturally, but virtually all of the Citrine in jewelry is treated (heated) Amethyst. Amethyst and Citrine have the same chemical/physical properties, but are different colors. There is no way for a gemologist to tell the difference between "natural" Citrine and heated Amethyst. Reputable jewelers and wholesalers will identify lab-created stones as "synthetic" including Rio Grande Jewelry. 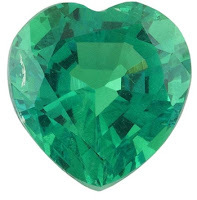 They offer synthetic gems---emeralds, rubies, sapphires, and Moissanite---but all of their Amethyst offered right now on their site is natural. I don't recall ever seeing synthetic Amethyst there, but I may have missed it. They clearly identify each gem sold as "Natural" or "Synthetic" as well as any treatments. Their natural Citrine is clearly identified as "Heat-treated". Rio Grande Jewelry is the most reputable wholesale company that serves the jewelry industry worldwide. They do NOT offer any kind of "hydroquartz" of course. If Amethyst is lab-grown, then it would make sense that Citrine and probably Ametrine are also produced as well. However, while synthetic Citrine exists, and described as "synthetic," not ALL Citrine "hydroquartz" is genuine quartz though. There are also lots of glass stones sold as various colors of "Ametrine" including weird colors such as blues, greens, and bright pink in addition to purple and yellow---obviously NOT Ametrine! Synthetic gemstones, including lab-created Amethyst and Citrine, would therefore be sold at a higher price than other "hydroquartz" stones, which are inexpensive and sold online. 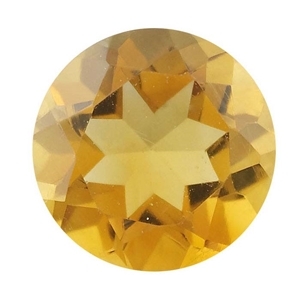 Please keep in mind that a lot of Citrine "hydroquartz" stones being sold online are not actual quartz--not really synthetic gemstones--but are still just colored glass. They are non-crystalline. A Nanogem is a man-made, glass-ceramic material with nano-sized crystals of spinel within its matrix. These stones have exceptional physical and optical properties with a more uniform color than CZs, synthetic quartz or synthetic corundum, and a hardness, reflective index and luster that is very close to natural gemstones. 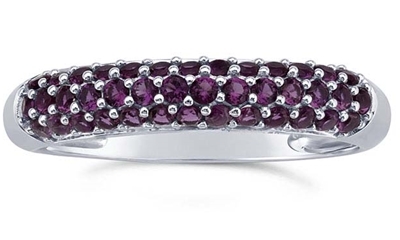 Rio Grande has these stones in rings on their website, in colors that look like Amethyst ("purple Nanogems"), and other pieces that are pave-set with these stones in a wide variety of colors. They offer these Nanogems in a limited variety of styles and colors as they are "new" to the marketplace. It's impossible to tell online whether Amethyst or Citrine are actually quartz or are glass. It would have to be examined by a gemologist for crystal structure. So therefore, it should NOT be assumed that "Amethyst hydroquartz" or "Citrine hydroquartz" are genuine gems. Lab-grown gems, including Amethyst and Citrine, are referred to as "synthetic" gems. Personally, I would prefer purchasing "Synthetic Amethyst" (as opposed to anything described as "hydroquartz), and then have it verified. Since every single piece of hydroquartz that I have purchased and have had examined by a certified gemologist has turned out to be non-crystalline glass, I do NOT recommend "hydroquartz."